Some anniversaries make you feel old. Some of ’em make you feel young. And some – like the 40th anniversary of this, punk rock’s quintessential and inaugural album – make you feel both old and young at the same time. 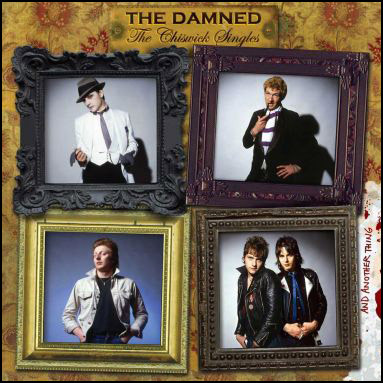 THE DAMNED‘s first album, Damned Damned Damned, was released in late February 1977 on UK upstart Stiff Records and in the last year it’s been reissued on both vinyl (Drastic Plastic USA) and now CD via BMG UK. It’s one of those records that never loses its cheeky appeal. Yours truly didn’t discover The Damned until 1981-1982 (via an IRS Records sampler featuring 1980’s “Wait for the Blackout”), and by then they’d undergone a bit of maturing. But on their debut disc, The Damned were a rowdy, youthful quartet just happy to be making noise and having someone record it. Producer Nick Lowe was that someone, and you don’t have to consult reissue liner notes or Wikipedia to tell that his job was primarily to keep the youngsters focused long enough to get a dozen songs on tape. 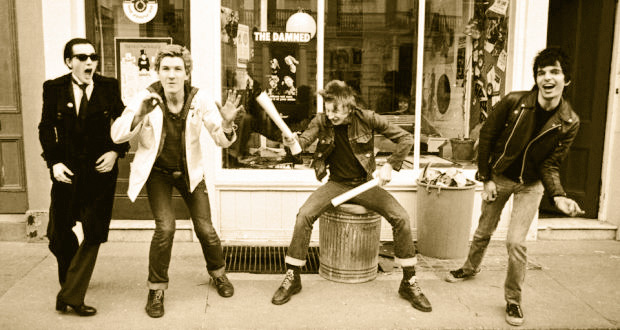 Just listen to Damned Damned Damned and you can hear all the joy and energy these guys exuded. Whether it’s their debut single, “New Rose” (“is she really going out with him?”), followup single “Neat Neat Neat,” or any of the other punk classics here (I’ll cite “Fan Club,” “Born to Kill” and “Feel the Pain” as my favorites), this barely 30-minute “long player” charges out of the gate like a horse not just going for the win but running for its life. By the time closer “I Feel Alright” (aka The Stooges’ “1970”) finishes, there’s no doubt that this album deserves its inclusion in the top of the punk pops. Damned Damned Damned still has a lotta life in it. Whether you pick up the late 2016 vinyl reissue on Drastic Plastic (available on 150 gram yellow or 180 gram black vinyl; excellently mastered by Kevin Gray at Cohearant Audio), or the brand new 2017 BMG CD (no weight or mastering credit), you can’t go wrong. I like the vinyl for Gray’s beefy mastering job (the CD’s a tad bit thinner-sounding), but the CD comes in a book-style package with some great liner notes and photos. Neither has any extra tracks, though, so for those you’d have to grab one of the compilations like 2005’s 3CD box set, Play It at Your Sister, et al. 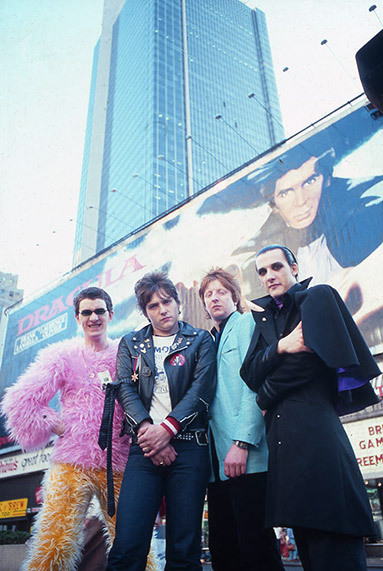 There have been way too many changes in personnel, temperament and outlook over the last four decades to detail here, but in ’76-’77 The Damned were vocalist Dave Vanian, guitarist/songwriter Brian James, bassist Captain Sensible and drummer Rat Scabies; a buncha guys with colorful names making raucous rock ’n’ roll. Today only Vanian and Sensible remain (the latter having switched to guitar a long, long time ago), but the band – who have made a number of great records since 1976 – still tours regularly and this year they’re touring that killer record they made forty years ago. It’d be a shame to miss the chance to hear this punk classic performed nice ’n’ loud right in front of yer face by the only band that still matters, The Damned. Compilations of a band’s singles – both the ‘A’ sides and the lesser-known ‘B’s – can be a dodgy thing. Typically the ‘A’ sides are worth having, but the ‘B’ sides are throwaways that exist only because something had to occupy the other side of the record. 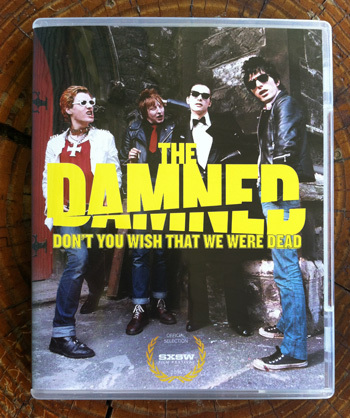 But then there are bands like The Damned, who like few bands before and after them, put out 45s that killed. The Chiswick Singles… And Another Thing is a single CD/double LP that showcases most of the band’s singles from the fertile 1978-1981 period (for some reason “Wait for the Blackout” and its flip “Jet Boy Jet Girl” are missing), and it’s a cracker of a comp. By ’78 Dave Vanian, Captain Sensible and Rat Scabies had already disbanded The Damned, farted around for a year, and got back together with a new bass player. Sensible switched to guitar after original guitarist Brian James left and the band flourished. I don’t know if that’s a coincidence but I prefer to believe it’s not. Anyway, here you get 24 tunes, 21 of them from their Chiswick Records, post Stiff/post-punk tenure which spawned the classic Machine Gun Etiquette (1978) and the almost as good followup, The Black Album (1980). The final 4 tracks come from their ’81 EP, Friday 13th. Spread over one CD or in this case, a really sweet 2LP set on red splatter vinyl, this compilation has quintessential tracks like “Love Song,” “Smash It Up” and “I Just Can’t Be Happy Today” as well as goofy/fun B-sides “The Turkey Song” and “Billy Bad Breaks,” plus experimental (read: filler [?]) things like “Sugar & Spite” and “Seagulls.” I’m not saying that everything here is a must-have, but I am saying that everything here is a must have for a Damned nut like me. If you’ve had trouble filling your vault with The Damned’s faultless singles, look no further. And since it’s available on both CD and vinyl, you can now finally have ’em all in one handy format of your choice. 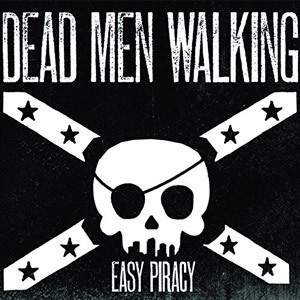 I’m not gonna start this by trying to persuade you that Dead Men Walking are a supergroup, because they’re not—the last group that fit that description hasn’t made a record in over 25 years, and two of the guys aren’t even available to record again even if they wanted to. Besides, calling any group of musicians made up of people already known for other bands they’ve been in is just plain lazy. The only reason you read me using the term is because it’s already been used to describe these guys. Made up of Captain Sensible from The Damned, Mike Peters of The Alarm, Slim Jim Phantom of Stray Cats, and Chris Cheney of The Living End, Dead Men Walking sound like a rock band with a lot of rockabilly and punk edges. And that’s what you’d expect considering the bands that got them to where they are today. There are a slew of great songs among the fifteen on Easy Piracy, the group’s first actual release. “The Weather Song” sounds like a rockin’ acoustic Damned song (it’s one of the few sung by Sensible), while “Damned Damned Damned” starts off sounding like a take on Ramones’ “Teenage Lobotomy” until the melody kicks in. The lead off track “Rock and Roll Kills” has some great lyrics, like many of the songs here, while “Whatever Turns You On (Will Turn on You)” isn’t too shabby and wins the Best Song Title award for the album. I can go for “Dr. Henry,” too, but I need to do a little more research to tell you what it’s about. “Song for Eddie,” though, is definitely about rockabilly rebel Eddie Cochran (not the Heinz hit of yesteryear). I think this is an album I’ll listen to more than a handful of times. Let’s face it—how often can you say that these days?